If you're looking to get started with embroidery we have machines for less than $1000 and even pre-loved machines to fit every budget. We have the advanced top of the line machines for the embroidery enthusiast as well. We have every level of quilting machines in or stores. If you ready to start at home as a beginner, to the new 6ft quilt frames all the way up to our 12 ft frames for the serious quilters, we have the right selection to fit everyone's needs. A serger does more than give projects a finished and professional look... this compact machine complements your sewing room. 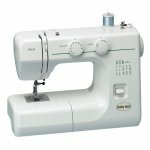 Sergers create ravel-free seams, tight overlock stitches, and decorative edging.